We believe the share price is current undervalued due to exiting legacy shareholders from Evans Brewing Company. The company reversed merged in February 2018. Corporate management believes the share price will self correct over time and steadfastly refuses to engage in share buyback program to support legacy shareholders who wish to exit. Recent Company guidance is of no interest to investors. 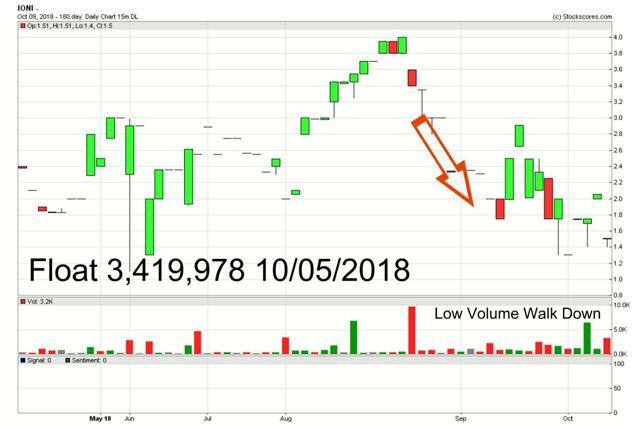 $IONI Share price with 3.4 million float (as of 10.05.2018) and no dilution should easily maintain a daily $4-6 price range. I-ON Communications, Corp, (OTCQB:IONI) is a Seoul, South Korea-based enterprise software company founded in 1999. I-ON has sold to over 1,000 mid to large clients across numerous verticals in both the private and public sectors, primarily throughout South Korea, Japan and Southeast Asia. The Company has 11 products at market that enable clients to create, measure, and optimizes digital experiences for their audiences across marketing channels and devices. I-ON’s large R&D team has designed and developed industry-leading technologies that are compliant with global standards including GS (Good Software) and NET (New Excellent Technology), while holding numerous domestic and global industry awards and recognition from the likes of Gartner and Red Herring. As set forth in a Current Report on Form 8-K filed on February 1, 2018, the Company consummated the Merger Agreement with I-ON and I-ON Acquisition Corp., a wholly-owned subsidiary of the Company, which merged with and into I-ON in a statutory reverse triangular merger, with I-ON surviving as a wholly-owned subsidiary of the Company. Following the consummation of the Merger, and upon the issuance of the merger shares and the shares to be issued in connection with the Spin-Off, the Company will have approximately 32,000,000 shares of Common Stock issued and outstanding and the I-ON shareholders will beneficially own 26,000,000 shares, or approximately eighty-one percent (81%), of such issued and outstanding Common Stock. Total revenue came in at $9.2 million versus $9.2 million in 2016 and was composed predominantly of royalty, licensing and customized solutions and services. Major customers in 2017 included Korean Broadcasting System, Hyundai AutoEver, JoongAng Ilbo, Samsung, and the KPGA among many others. I-ON’s top ten customer contribution approximated 52% of total revenue, consistent with recent trends. Gross income was $3.0 million versus $4.5 million in 2016 due partially to a shift in revenue mix and timing of new product launches, while operating expenses declined to $2.4 million from $3.5 million owing to less R&D to pivot more towards direct sales, marketing of newly launched products, and international expansion efforts. Operating income, as a result, came in at $586,679 versus $1.0 million in 2016 and comprehensive income was $766,803, in line with the prior year. As of December 31, 2017, I-ON held total cash and equivalents of approximately $3.1 million, working capital of $6.7 million and total current assets of $8.6 million, a 14% year-over-year (y/y) increase. Total assets grew to $10.2 million from $9.2 million. Current liabilities grew slightly y/y to $1.9 million from $1.8 million, while long-term debt of $280,007 remained negligible and relatively unchanged. The Company also has available lines of credit with financial institutions for up to $3.7 million, of which there were no outstanding balances as of the end of 2017. Shareholders’ equity increased 11.4% to $8.0 million from $7.1 million in 2016. I-ON remains optimistic about the health of its business prospects based on existing engagements and initiatives taking hold, as well as the intermediate to long-term secular growth trends reflected across the digital marketing ecosystem. As a result, the Company is maintaining its 2018 revenue guidance of $15-17 million, which assumes, as part of its stated strategy, the consummation of one acquisition by the end of 2018 and modest double digit organic growth. The Company is also implementing a plan to attain a revenue target of $25-30 million by the end of 2019, which would reflect an improving revenue mix and higher y/y gross and operating margins, above 40% and 15%, respectively. I-On Communications has a healthy balance sheet, no convertible notes, 3.7 million in untapped bank lines and 8 million in shareholder equity. The company is well positioned to raise capital growth and is seeking to uplist to either the NASDAQ or NYSE in early 2019. The current share price ($1.40 range) is selling far below book value and will continue to do so till the company attracts new investors and divests itself of the outgoing legacy shareholders. $IONI management will have to address the share price if they wish to uplist to a higher exchange. Disclosure: I am/we are long IONI, I-ON Communications, Inc.